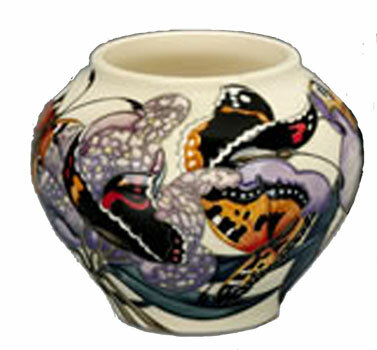 Moorcroft Butterfly Peacock Tortoiseshelll and Red Admiral Discounts Apply ! Butterflies provide one of the most exquisite visual experiences to be found in the Countyside, and spotting and identifying the is a pleasure for designer and lepidopterist Emma. This Collection takes the viewer into a secret world of butterflies depicting their beauty and their fragility and the great and varied colours. Peacock Tortoiseshell and Red Admiral captured by emma on this piece as the shape lends itself for this quantity of colour and vibrancy with these 3 butterfly's .